"You don't have to wear that" my friend once said looking at my headscarf -- damn it, don't I know it already? I know I don't have to wear it, and I also know my choice was not done independently. Years of research, reading feminist literature, philosophical literature, Islamic literature, catholic literature and spiritual literature led me into choosing to wear a scarf. I didn't wake up one morning wanting to wear a scarf. It took me a long time, but in the end, regardless of all the hurdles and struggles. I knew that for me it wasn't just a feminist choice, and it certainly was not done out of rebellion to my parents, nor culture for that matter. It was a spiritual choice. I believe that God commands both men and women to be modest. Though modesty could be a side-effect of wearing a hijab, the primary reason for wearing one is because I believe it was commanded by God. Can a feminist wear a headscarf, and stand in solidarity with women that have had their rights violated? In one of my study groups, I was taken by surprise by one of my Muslim colleagues. He argued that wearing a Hijab symbolises subservience to men, and it illustrates a divide between the Muslims that do wear it, and those that do not. It never occurred to me that I would face problems among feminists when trying to justify why I wear a headscarf (referred to as Hijab by Muslims). 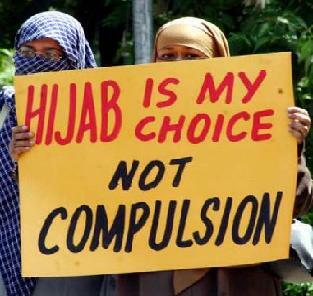 It did not come to my mind that some would find the wearing of Hijab to simultaneously condone violence against women. Especially since I have been an active speaker for rights of women. When I wear a Hijab, I don't believe it contradicts me being feminist because feminism is not just a political movement, it is an intellectual movement to empower women through education, self-awareness and self-determination. While Islam acts as an important aspect in my life, wearing Hijab was my choice - questioning how much of a choice I have exercised is to question my intellectual ability as a human being. Of course I was influenced by the literature I read but ask yourself this, is anyone immune from influence? The clothes you wear, choice of make-up, music and people you hand around with -- are they all conscious choices without any influence? The answer is no. We are all influenced by different things, but so long as the influence is not shoved down our throats, and so long as we have the freedom to choose, surely, it doesn't amount to oppression. So we can establish that wearing a headscarf can be a free choice, a spiritual and feminist one at that. It's evident from the thousands of Muslim women living the West where they have been very vocal about wearing a headscarf. Can we illustrate that wearing a headscarf is not forced upon us intellectually by men who want to conceal our sexuality, and force us to hide it because they're too incompetent to control their desires? The assumption here might be that the headscarf is imposed by men to begin with which is not true, at least not in my case. Muslims believe that wearing a headscarf is a command from God. A God that is not masculine nor feminised. Their understanding and interpretation is rooted to both the Prophetic precedent and Qur'an. Of course there are Muslim women who do not wear a Headscarf, that doesn't make them any less 'Muslim' and it should not be a means of measuring how pious or God-conscious an individual is because God specifically mentions in the Qur'an that the most righteous is the one that is most conscious of God. This means, we can't argue that the Hijab is imposed by men because Muslim women reject the notion that the Qur'an was a fabrication of men in the 7th century. They believe it is the unchallenged word of God revealed through an angel to Prophet Muhammad. In addition, the next question is whether it is a means of hiding one's sexuality. First, what do we mean when we speak of one's 'sexuality'? Is sexuality hidden through how we dress, or is the way we dress a manifestation of our sexuality. The answer is simple, sexuality has nothing to do with wearing a headscarf. The organs which we are born with are not the necessary elements which determine our gender, and therefore wearing a headscarf is not a matter of concealing a woman's sexuality. What freedom means to women is the ability to choose, and feminism is all about respecting the choices other women make, regardless if we like it or not. I don't particularly like certain feminist choices, but I have to respect them if I want to be true to feminism as an intellectual movement. A movement that seeks to empower women to make their own choices with as little influence, and intimidation possible. What we can't guarantee in our society, or any society for that matter is that the choices which women make are not influenced by anything. Let's face it. If women make any choice, it must be influenced by something. We don't live in a world of spontaneous meaningless choices. What matters is whether the choice was made consciously, and not under intimidation. This is how we distinguish between what women choose freely, and what they are unfairly forced to do. In instances where women are forced to dress in a certain way, it could be the social pressures that a teenager goes through in high school, or it could be in certain Muslim dominated countries where the law dictates that women must dress a certain way. Whichever is the case, both are unfair. However we can't say just because some women might be forced, and probably are in certain countries to wear a headscarf that all women that do wear one are forced. Ruwayda Mustafah Rabar is a second year law student at Kingston law school, having written several articles about gender and Islam, and travelled eastern countries throughout her youth. She has an interest for comparative religion, culture, and effects of globalisation. She's is a British-Kurdish writer based in United Kingdom, and is the CEO of Muslim Cancer Support – A student based community support for those diagnosed with cancer from ethnic backgrounds.